Just a dozen years after Charles Darwin published The Origin of Species in 1859, growing numbers of scientists and other educated persons considered it impossible, indeed laughable, to suppose that humans were anything other than the modified descendants of an ancestral line of apelike creatures. According to Darwinists, the first undisputed fossil evidence for life on earth goes back about 2 billion years. 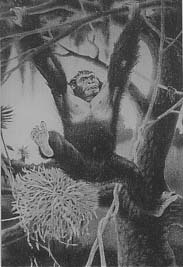 They say the first apes and monkeys appeared about 40-50 million years ago. The first ape-men (called Australopithecus) appeared about 4 million years ago. These were followed by other apemen called Homo habilis, Homo erectus, and Neanderthal man. The first human beings of modern type (Homo sapiens sapiens) appeared only 100,000 or 200,000 years ago. Civilization, according to modern scientists, is less than 10,000 years old. Those who blindly follow Darwin's ideas on human evolution do not see the pattern of suppression inherent in scientific investigation. However, Michael A. Cremo and Richard L. Thompson of the Bhaktivedanta Institute investigated hundreds of scientific reports showing that humans or near humans were living millions of years ago in the Pliocene, Miocene, or earlier periods. This evidence was not regarded as anomalous by the scientists who introduced it in the late 19th and early 20th centuries, since they were contemplating theories of human origins that were compatible with this evidence. Then, with the development of the modern theory that humans like ourselves evolved within the past 200,000 years in the Late Pleistocene, this evidence became highly unacceptable, and it vanished from sight. Forbidden Archeology: The Hidden History of the Human Race presents a representative sample of this anomalous evidence suggesting that humans have been on the earth for millions of years, ,just as the ancient Sanskrit writings of the Vedic literatures describe. The Vedic histories inform us that humans have existed since the beginning of the day of Brahma, about 2 billion years ago. Cremo and Thompson conclude that even the conventionally accepted evidence does not offer a cohesive picture of the missing link; instead, the multiplicity of proposed evolutionary linkages among the hominids in Africa creates a very confusing scheme of human evolution. They call for a drastic revision of the now-dominant assumptions about human origins.